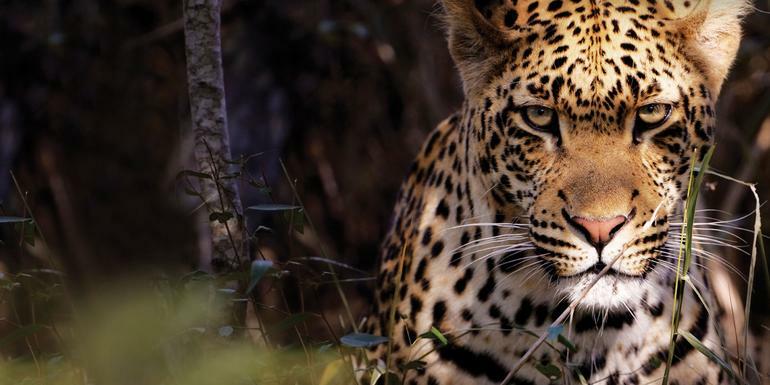 Short and to the point, if you're already in Joburg or simply hungry for a taste of South Africa's exceptional wildlife and culture, this 4-day safari adventure will certainly hit the spot. 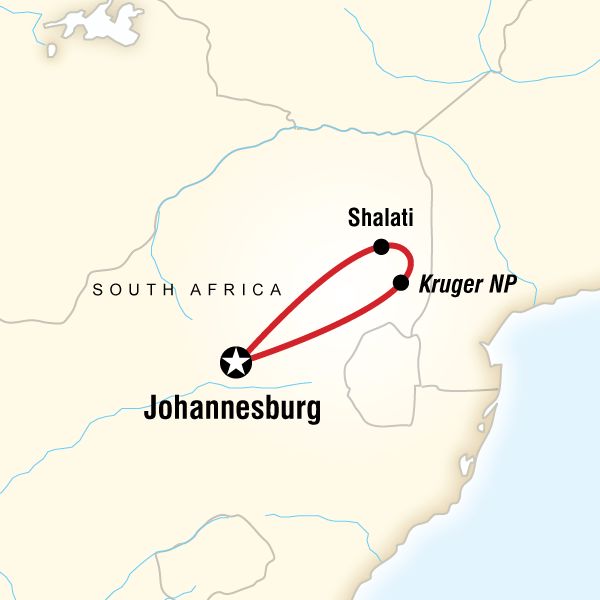 Starting in Johannesburg, you'll head into world-renowned Kruger National Park—one of the largest and most diverse wildlife areas in Africa and home to zebras, elephants and lions. Travel is via a small 19-seat minibus. Participatory camping keeps you under the stars and, thanks to our long-standing community ties, you'll get plenty of invigorating local interaction as you meet the people of Shalati. The African wilderness is closer than you ever imagined. Your G for Good Moment: Hope Africa Children's Day School, Manyeleti. Traditional Shangaan dinner and dancing. Kruger National Park entrance with wildlife safari drives. Visit to G Adventures-supported Children’s Day School. All transport between destinations and to/from included activities. GENERAL: Look after your personal items. Do not leave your valuables visible in a car or hotel room. Lock your hotel room door when you enter and when you leave. Do not carry large amount of cash on you. Avoid displaying flashy jewellery and carry your camera in its pack on your shoulder rather than around your neck. Keep your passport, airline tickets, money, important documents locked up in your room/safe - do not carry it with you. Vital Information when you are staying the KNP or any Reserve: Please ensure that your stay is happy and safe by taking note of a few simple warnings. You will be sharing your stay with many exciting and unusual creatures but without knowledge some of them could be dangerous: Example: Bats, Spiders, Snakes, Scorpions, Malaria Zone. If you must walk around at night please DO NOT DO SO WITHOUT A TORCH. Remember: by feeding any wildlife, you are signing their death warrant as they become aggressive! You will be on the move a lot, so our advice is to pack as lightly as possible. Your baggage should be clearly labeled and restricted to one soft compact suitcase, or sports bag, maximum 15kg, plus a daypack. Luggage limits on airlines are strictly enforced and space on vehicles is limited. Porters are not often available, so be prepared to carry your own bags. For our camping style tours you will need to provide your own sleeping bag, small pillow and sleeping sheet (if you would like). We provide the tent and the sleeping pads. It is important to pack clothes for warm days and cool evenings, as well as a warm jacket for early morning wildlife safari drives. A set of smart casual clothes is also advisable. Camping in Africa is truly an adventure. You will be able to get off the beaten track to get a first-hand experience of the beautiful wilderness and nature. While camping, we stay at designated campsites in national parks and outside towns. Campsite facilities in southern Africa are generally good, but can be basic in certain places. There are generally small restaurants and/or bars, washing facilities and occasionally telephones available. The camps have flush toilets, and showers at some camps are outdoors, having simple reed enclosures for privacy. Additionally, warm water is available at most sites, but it is not guaranteed to always be warm when you take your shower; the warm water may be used up others who also use the camp. We usually set-up camp within close proximity to the toilet facilities, though occasionally to reach them you may to walk a short distance. All camping equipment (with the exception of your sleeping bag and pillow) is supplied, including camp mattresses, which are warm and comfortable. We supply dome tents and assembly/disassembly takes only 5 minutes. They are good quality, durable, industry-standard 2-person safari tents. Please note that most adults will not be able to fully stand up inside the tents, though most travellers find these more than adequate, as they have a base area of approximately 4 square meters. These tents are regularly treated with a waterproofing agent, but under certain rainy conditions, the tent fabric may become saturated to the point where seepage or leakage may occur. All tents have built-in mesh insect netting on the windows and doors. We travel with our own portable camp chairs with a comfortable back-rest, and we utilize our own cooking equipment to provide the group good quality camp meals. In camping within the national parks and conservation areas, some camp sites are enclosed for keeping the resident wildlife out. Other camps are open to the natural environment – care must be taken, especially at night, when a torch/flashlight is recommended when walking around the camp area. Despite the challenge that a few days “roughing it” may pose to some, the experience of being that close to nature, camping under the African stars, and seeing incredible wildlife at your tent door-step is not just gratifying but ultimately an experience of a lifetime. On this tour, you will be accompanied by Chief Experience Officers (CEO's) – depending on the size of your group you could have a crew of one - driver/guide/cook (group size 1-8); if your group is 9+ you will have a crew of two - a driver and cook. All of our CEO’s in southern Africa are experienced group leaders, with a broad knowledge base of the region’s history, cultures, and wildlife. Most of our leaders in the region are from South Africa, though it may be possible that you’ll have a leader from another country in the southern African region. All of our overland adventure vehicle (OAV) drivers are experienced in the routes travelled, and highly skilled in dealing with different terrains. All of our cooks will organize and lead the meal preparation, and have experience in cooking a variety of local and international dishes for large groups. We also use local guides for some included activities where we think more specific knowledge will add to the enjoyment of the places we are visiting.